Today I was able to attend a toy show in Parsippany, New Jersey called ToyConNJ. This was a very nice show that featured a ton of vendors, fun stuff for the kids to mess around with, and most importantly new Mythic Legions figures! Yes, the Four Horsemen were there, and they came with a whole mess of the recently released “Advent of Decay” Mythic Legions figures. In addition to that, the Horsemen had two characters from the upcoming “Soul Spiller” wave early: Fury Clan Orc and Lord Veteris. Now the good Lord Veteris I could give or take, but a red Orc? No way I was passing on that. I’m all in on orcs with this toy line. I’m building my own unofficial World of Warcraft and the Fury Clan is my Draenor Orc. Despite their harsh name, the Fury Clan Orcs are known as much for their intellect as they are for their savagery. These fiery red beasts are often recruited as assassins among the ranks of Arethyr’s armies. Unsettlingly precise in their methods, the ways of the Fury Clan’s warriors stand out in stark contrast to those of their green-skinned cousins. These discrepancies in style and method are so pronounced that they often lead to unwelcome infighting whenever the varied clans are stationed together. I destroyed the box, sorry. I didn’t even wait until I got to the parking lot to open this guy. I had to mess around with him. My children likely have more patience than me with new toys. The Fury Clan Orc comes with both masked and unmasked heads. While I think the helmeted head looks sharp, I think I have a bit too many of them already so this guy is likely to stay unmasked. I don’t believe there is any new tooling here, I don’t recognize the shoulders he comes with. It’s entirely possible they belonged to a human, but I didn’t buy a lot of them. The new (for an Orc, anyways) shoulders are a nice way of distinguishing him from the guys in the green-skinned Orc clan. So hopefully in the future, we can get a few more red guys. He was bundled with the other figure, and that cost a total of $80 at the show. I’m pretty sure if you preordered this guy he was a little bit cheaper online, so I hope you don’t feel too bad that a few early ones got out. I know I’m still going to have to jump on their “Soul Spiller” in-stock sale, whenever that happens. At the very least, I have to get my hands on the Ice Troll and Thallyn Frostbow. 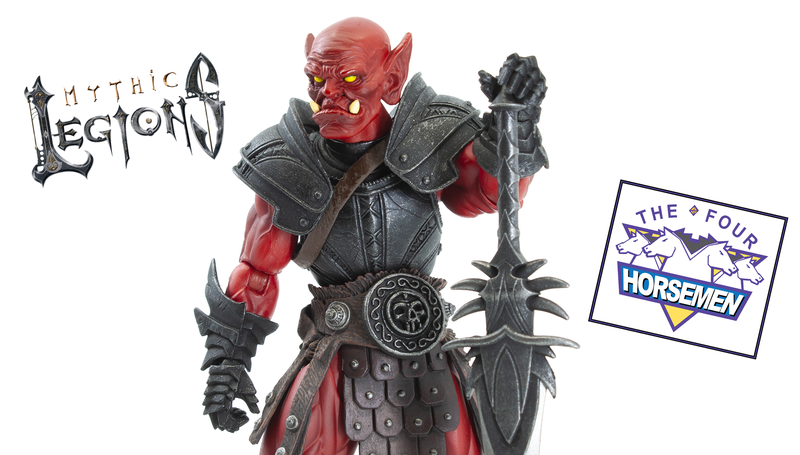 If you are already a Mythic Legions fan or collector, you know what to expect here. The quality is solid and he comes with a great spread of accessories. If you are new, he’s a red Orc and he owns. You’d be hard pressed to find a better figure to jump into this line with.